A new booklet is being launched tomorrow that aims to advise motorists how to behave when they see emergency services dealing with an incident on the road. WHAT IS THE correct way to behave when sharing the road with emergency service vehicles? A new booklet is being launched to advise motorists on just that, and aims to tell the public about what to do if they see emergency service vehicles on the road – and if they see them dealing with an incident. 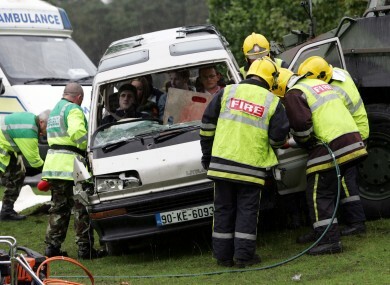 The Road Safety Authority (RSA) will launch its new booklet, ‘Sharing the Road with Emergency Service Vehicles’ in the McKee Barracks, Phoenix Park on Thursday morning. The booklet is being launched to advise motorists on the correct way to behave when sharing the road with emergency vehicles and when they encounter the emergency services dealing with incidents on the road. Emergency services personnel risk their lives every day to help others. They might be called out to a medical emergency, a fire and rescue, a disaster response or indeed to assist in a roadside breakdown. Therefore, when using the public road, it is important that all road users pay attention to emergency vehicles as they make their way to help others. Emergency vehicles include Ambulance, Fire Brigade, Coast Guard, Prison Service, Defence Forces, Civil Defence and Garda vehicles. In attendance at the launch will be Leo Varakdar TD, Minister for Transport, Tourism and Sport, Noel Brett, Chief Executive of the Road Safety Authority, Major General Conor O’Boyle, Irish Defence Forces and Assistant Commissioner Gerard Philips, An Garda Síochána. Email “Drivers advised on how to share the road with emergency service vehicles”. Feedback on “Drivers advised on how to share the road with emergency service vehicles”.